Jeans should fit perfectly on your frame, leaving no room for bulging or other unsightly sagging in the hip area. Conversely, jeans should not sit so tightly on the body that nothing is left to the imagination. 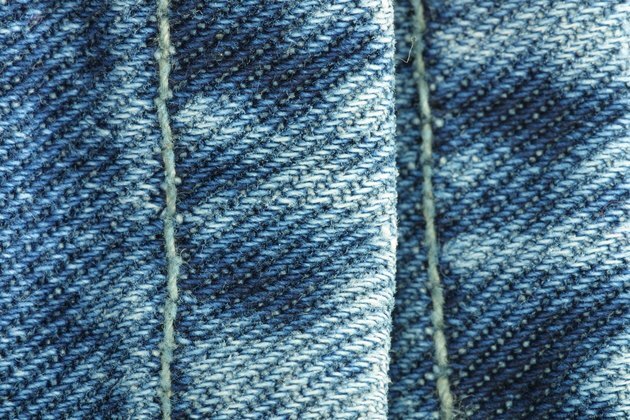 The thick denim on a pair of jeans means smaller darts should be placed on the waistline of jeans to ensure comfort and the right fit. A bit of sewing experience is recommended in altering your own blue jeans. Put the pants on. Grab the extra cloth around your waist at the back of the jeans, along the back center seam. Have a friend mark the point on each side where the extra fabric begins. Mark just to the inside of where your fingers are pinching the cloth. Measure vertically from the top of the back of the jeans to the point on your back side where the jeans begin to fit correctly -- for example, 4 inches. Take the jeans off. Turn the jeans inside out. Take apart the back center seam with a seam ripper to the point on the jeans where they will fit again -- in this example, 4 inches from the top of the back center seam. Pull together the two sides of the undone seam and pin together with the right sides facing. Pull the sides together along the marked lines you created before to create a dart. Pin the extra material at an angle that slowly meets up with the original cut of the pants. The excess cloth should be in the shape of a V.
Thread your sewing machine with some heavy-duty thread. Sew along the pinned area on the seam using a tight basting stitch. Tie off both ends of the thread in a secure double knot. Trim off the excess thread. Try the pants on to ensure the fit is correct. Trim away the excess cloth on the dart if the pants fit correctly. Only trim away extra cloth after you are sure that the jeans fit you correctly.